Currently being enlarged by Europe's biggest reactor, the Finnish nuclear power plant, Olkilluoto is located in the middle of a dense forest, as in a fairy tale. 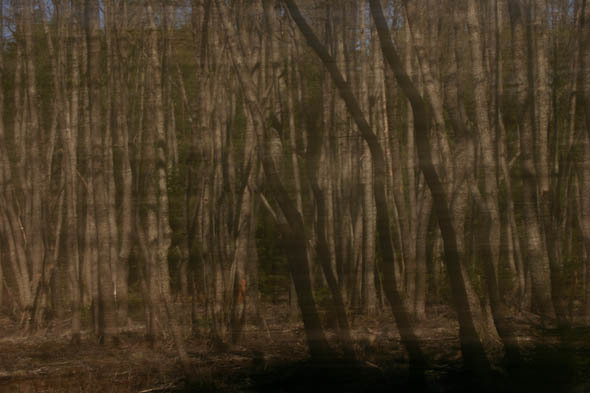 The work combines sound material from inside the power plant, recorded with contact microphones, with images of the nature outside the power plant, photographed at long exposure. Out of the silence evolves a tone, out of the blackness an image - as both partners and opponents, evoking each other, superseding each other, and growing together. The still projection, as it would appear at first glance, begins to develop, almost unnoticeably, until it dissolves before the eyes of the spectator. Singular elements of the "still" are morphing, gradually, into a state of continuous vibration, its consistency changing, suggesting wandering points of view, indefinable levels and fictional offers of space. Originally the notion of "filament" was applied to organic structures, especially of trees. In the course of technological evolution, it has become applicable to human artefacts, too.